Karl Bruno Mathsson (1907-1988) was one of the leading figures of the larger Scandanavian Modern movement that included Sweden, Norway, and Finland along with Danish Modern design. Mathsson designed relatively few pieces, but his original forms and pioneering use of materials helped to make "Swedish Modern" an international success in the 1940s-50s. 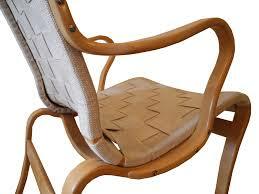 Mathsson was trained as a cabinetmaker by his father Karl at their family's furniture business in Varnamo, Sweden. His innovative designs formed by bending and laminating wood brought him national recognition at the 1930 Stockholm Exhibition, and later in his own show in Gothenburg in 1936. Early designs such as the Eva Chair paralleled the work of contemporaries like Kaare Klint in redefining the function of the chair, but unlike Klint's use of traditional forms, Mathsson pursued function as a primary goal, searching for new methods that would engineer comfort and ease-of-use into the piece itself, rather than requiring the user to adapt to the chair. To the contemporary eye, his Eva, Miranda, and Pernilla chairs are clearly the embodiment of ergonomic principles adapted and displayed as an exo-skeleton rather than hidden under upholstery. Although Mathsson produced fewer furniture designs after WW2, focusing instead on architecture, his output included memorable tables including a 4-panel folding table and the Super-Ellipse Table co-created with Piet Hein. His monument remains the Eva chair, which natural materials and simple,comfortable shape symbolize the best of mid-century Swedish design.